CTU President Karen Lewis addresses the media as negotiations between the union and CPS continue Monday night. NEAR WEST SIDE — Minutes before a looming midnight strike deadline, Chicago Teachers Union and CPS officials reached a tentative contract agreement. Chicago Public Schools officials and CTU leaders remained at the negotiating table late Monday evening, but reached a deal after nearly 12 hours of negotiations as teachers prepared for a possible strike Tuesday. 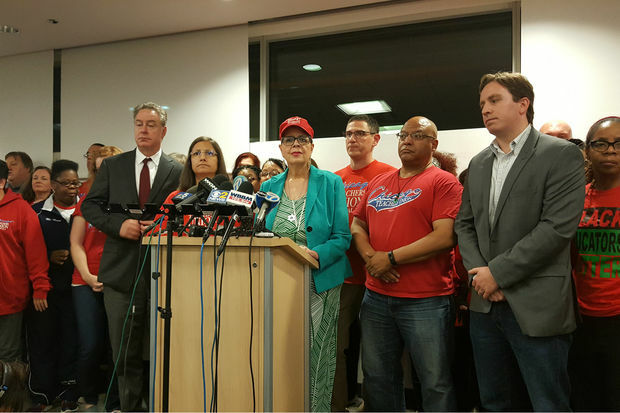 ""There will be classes in the morning," CTU President Karen Lewis announced to a room full of reporters just before 12 a.m.
At a 10 p.m. media conference at SEIU Healthcare, 2229 S. Halsted St., Lewis said there was no deal yet, but said the district had made a "significantly better" offer than it had previously. "We're deliberating" about whether to accept the offer, she said. "We are working on it," she added. She said families would "have to stay up a little later" to find out whether the 380,000 Chicago school kids would be going to school Tuesday. CPS Chief Education Officer Janice Jackson said she was optimistic a strike could be averted. "We do believe we are close and we are hopeful we will reach an agreement very soon," she said. Earlier, union officials had tweeted at 8:13 p.m. a photo showing CTU vice president Jesse Sharkey meeting with the union's "Big Bargaining team," which must review offers from CPS that merit additional consideration, union leaders said. "We are down to the wire in negotiations with the Board of Ed," the union tweeted. Shortly before 7 p.m., the union said it was holding out for a $500 increase in funding per student. That would cost an additional $200 million and would require the city to dip into TIF funds, which remained a sticking point, the union said via Twitter. At 5:45 p.m. Monday, longtime Ald. Danny Solis (25th) said the fact both parties were still at the bargaining table is a "good sign" a strike could be avoided. But earlier in the day, teachers headed to pick up picket signs and union T-shirts at a makeshift Chicago Teachers Union strike headquarters on the Near West Side. Cutting twine and posts for signs that read "On Strike," union reps welcomed hundreds of delegates from across the city at the Teamster's 705 Hall at Paulina and Van Buren Monday afternoon. "You don't do all of this unless it is serious," CPS teacher Ed Hershey told DNAinfo Chicago from strike headquarters Monday. The union released a statement Monday saying that a last-ditch bargaining session with Chicago Public Schools were "expected to go late into the evening." While helping to open a new Mariano's at 3857 S. King Drive in Bronzeville at midday Monday, Mayor Rahm Emanuel said, "Literally, as I'm here cutting the ribbon, there are people at the table negotiating." Emanuel expressed optimism over "a positive working environment to seek what I think is a shared goal, which is kids are in school tomorrow, our teachers are teaching them." Emanuel added, "Everybody's got their sleeves rolled up working toward an honest agreement that reflects everybody's interest." A poll paid for by the union found "broad—and deep—public support for Chicago Public School teachers," union officials said Monday afternoon. The poll of 600 people likely to vote in the 2019 municipal election found that 55 percent favored a strike if the two sides can not reach a deal. That compares to 28 percent of voters who oppose a strike, and another 17 percent who are undecided. Lake Research Partners conducted the poll during the last week of September. At strike headquarters Monday, union representative Martin Ritter said he expected to know if teachers are striking sometime after 7 p.m. but before 10 p.m. In 2012, the strike was announced before 10 p.m., he said. The 25,000 "organized and fired-up" teachers and other union members are certainly prepared to strike, Ritter said. "We're educators, we do lesson plans. We are prepared when the kids are in front of us and we are prepared if necessary tomorrow morning to withhold our labor," Ritter said. "It boils down to will the mayor make it a priority to spend $500 more per student in each Chicago school classroom." The $500 per student would guarantee restoration of personnel like librarians, social workers and nurses at every school and would reduce class sizes, Ritter said. On Friday, union President Karen Lewis said the $200 million necessary to add $500 a pupil would provide "everything we need to fund schools so that they work well." Ald. Pat Dowell (3rd) on Monday endorsed an idea floated last week to give surplus money from Tax Increment Finance funds to CPS to help avert a strike. "I think some TIF money should be provided to CPS," Dowell said. Hershey, a teacher at Lindbloom Math and Science Academy in West Englewood who participated in the 2012 strike and a one-day strike in April, was helping to hand out 30,000 signs and 50,000 twine strings to union members Monday. "It's looking like we're going to be out" on the picket line, said Hershey, of Pilsen. Lewis said that teachers would declare a strike "if we can't made headway by Monday night." On Friday, the union said that its members will not accept any cuts in pay or benefits in the contract being negotiated ahead of a possible strike Tuesday. CPS Chief Executive Officer Forrest Claypool insists CPS is offering "as generous a raise as possible" for teachers, though teachers have disputed that claim. Emanuel has called a strike "totally unnecessary" and urged teachers to accept an offer much like the one the union rejected last winter. 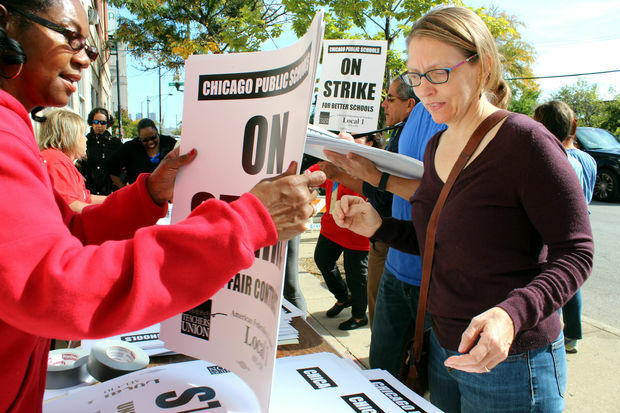 The union, however, has rejected any deal that includes an end to a 7 percent pension payment CPS has made for teachers since the '80s, stating that perk was hard-won then at the bargaining table, and making that payment now would constitute a 7 percent cut in pay. A year ago, Lewis called that issue "strike-worthy." The union stated in a release announcing Friday's news conference that it was pushing for "job security; no cuts to pay and benefits; adequate staffing levels; resources for students; and an additional $500 per pupil, or $200 million in new revenue for schools." If the teachers do strike Tuesday, Ritter said teachers will be at their home schools picketing as early as 6 a.m. A massive, unionwide rally would likely be underway by 11 a.m. at Emanuel's scheduled budget address at City Hall. "We have to make our presence felt because the mayor and the business elite need to know that we are serious," he said. Hundreds of Chicago Public Schools teachers picked up picket signs at CTU Strike Headquarters on the Near West Side Monday afternoon as negotiations between the Chicago Teachers Union and CPS officials are ongoing. Last week, CPS announced that all schools will remain open during regular school hours, even if teachers go on strike. In the event of a strike, CPS central office staff will be deployed to schools to serve as support staff and assist with activities to keep students engaged, said CPS spokeswoman Emily Bittner. Principals, assistant principals, security staff, janitorial staff, and special education classroom assistants will also be in their normal schools. "Although CPS and city partners are working diligently to ensure students have access to safe and structured locations for the duration of a potential strike, the district encourages families that have other options to make other arrangements," Bittner said. At Whitney Young Magnet High School, Principal Joyce Kenner, three administrators and "any teacher who crosses picket line" will be supervising any students who show up to school Tuesday, the veteran principal said Monday afternoon. While school buildings will be open, all classes, after-school activities and sports will be canceled, officials said.